With favourable home fixtures, Chelsea and Manchester City players appear the obvious options to turn to for Gameweek 11. Chelsea's midfielder is in outstanding form with three goals and three assists in his last three Premier League matches. Priced at just £5.8m in FPL and £8.8 in Sky Sports, he is a strong option to turn to, with Crystal Palace the visitors to Stamford Bridge on Sunday. Eden Hazard - who is in numerous fantasty football teams - is likely to return to the Blues squad but Barkley could be an option alongside the Premier League's top-scorer this season. If you're looking to tighten up your defence, Marcos Alonso - although expensive at £7.0m in FPL and £10.1m in Sky - has returned 72 and 76 points respectively this season. It would be easy to pick a City attacker for Sunday's match with Southampton but Pep Guardiola's rotation makes it difficult to know just who's going to play. At the back, Laporte has been a rock and has picked up 54 points in FPL and 87 in Sky. He's priced at £5.8m in FPL and £8.8m in Sky. Expect him to continue racking up the points throughout the season and another clean sheet could well come against the Saints. At the other end of the pitch, Sergio Aguero is almost a must-pick and will be captained heavily this weekend. Manchester United's French winger has been in sparkling form in recent weeks, with four goals in three matches. With renewed confidence and Romelu Lukaku and Alexis Sanchez struggling to set the world alight, Martial looks the United attacker worth turning to. A tricky trip to Bournemouth awaits United on Saturday but if Martial continues his rich vein of form, they could head back up north with all three points. He's priced at £7.1m in FPL and £10.5m in Sky and has picked up 41 and 38 points respectively so far this season. On the other side of the coin, Callum Wilson has been in superb form for Bournemouth and if you don't trust United to do the business, you could do worse than pick the Cherries striker. Liverpol travel to the Emirates on Saturday evening for what should be a mouthwatering clash with Arsenal. The Gunners will put Liverpool's unbeaten run to the test but with the front three of Mane, Mo Salah and Roberto Firmino, the Reds could have just a bit too much for Arsenal. Mane has already returned 63 points in FPL and 57 in Sky. He's a slightly cheaper option than Salah and after his two goals against Cardiff last weekend is a man in form. Arsenal striker Pierre-Emerick Aubameyang is also worth considering. 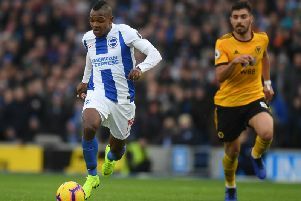 Brighton's defender has been a rock at the back this season and has helped the Seagulls to three successive clean sheets. The 6ft 5in centre-half has also netted two goals this season and on Saturday returns to Everton where he started his career. Admittedly it's a tricky fixture for Brighton but they go there with confidence and with games to come against Cardiff, Leicester, Huddersfield, Crystal Palace and Burnley, a decent points return could be in store for Duffy over the next few weeks. He's priced at £4.6m in FPL and £7.5m in Sky and has returned 45 and 52 points respectively so far this season.